When I first started to consider an Airstream as not just a recreational vehicle but as an actual livable space that we would call home, I did what any responsible adult who is looking to move their family into a 30-foot trailer would. I started looking up people and families on Instagram who were living this lifestyle and scouring their neatly curated feeds to justify and reassure me of my most recent life choices. Because let’s be real. There is no data better than the assumptions one can make from the perfectly edited photos and humble brags of complete strangers. Except that there is. There is real life and living a very real life alongside that which includes but is not limited to things like kids, jobs, families, friends, bills and all the responsibilities that come with being a respectable adult. When the topic of our next move into our Airstream comes up, people have a lot of questions, and I don’t blame them. I am 100% sure that if I wasn’t put in the position to move away from “the home” in Ohio, the type of home suburban middle class dreams are made of and the type of home we worked hard for I probably would not be looking to move into a home that we park wherever we happen to be at night. It wouldn’t make sense. Texas happened, and for a few reasons now it does. So many #nomads, #homeiswhereyouparkit, #rvlife people would have you believe that it’s all about walking away from the burdens of consumerism and the jobs to pay for it and living a life of freedom where you home school your kids overlooking the Pacific in Big Sur or hike gorgeous slot canyons for days either living off savings (they run out) or through nondescript self-employed gigs (download their step by step guide today on how to work from anywhere!). I’m a pretty normal chick with a pretty normal job and when I look at my future it includes a nice and intact savings account that hasn’t been depleted, my child’s education fund, my husband, our careers, etc. so while the hustlers of Instagram are filling my feed with the dream I’m over here just living real life trying to make it work for a family of three who was always on the go for the standard and typical reasons like everyone else who is busy with jobs, frequently relocated for work and family spread so far that Johnny Appleseed could have planted them in his quest for orchards from sea to shining sea. 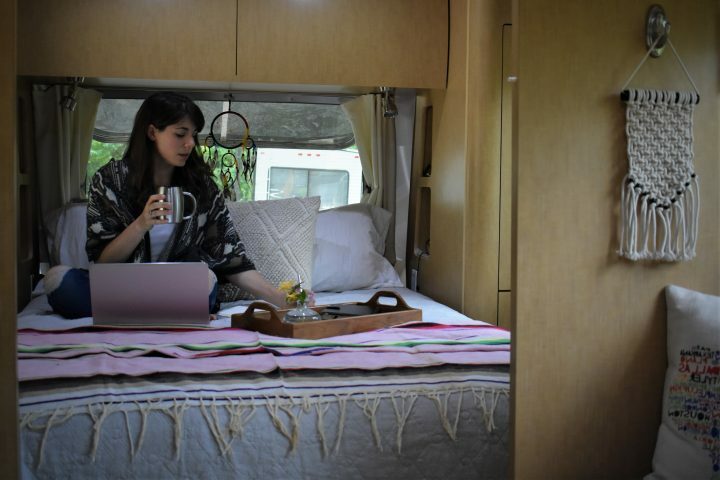 Moving into an Airstream was more about gaining a little extra freedom and flexibility in our normal lives than it was about going completely rogue and living life on only our terms. What can I say? We are willing to compromise with the rest of society. So, when I initially proposed this idea to my husband and whenever people start digging curious for details I explain to them that we aren’t going totally rogue just a “lite” version of rouge that includes a backup plan, our jobs and remaining primarily based in Houston, TX. We are not selling all of our life’s belongings. While this seems to be the norm for most families moving from house to RV our stuff is going into storage until we are ready to settle down. The Airstream idea was partially conceived over the thought of being able to bounce around a bit in the rather large Houston metro area and explore it so if we are lucky enough to get the chance to settle down in this awesome city we’ll have very much weighed our options. We have a back-up plan. Honestly, we’re lucky here; we don’t have much to lose. We currently don’t own a house. In my completely reliable Instagram research there are so many people selling it all and walking away from their lives to live the traveling RV lifestyle. We aren’t walking away from much. Sure, just a really nice, centrally-located and well-appointed apartment but you know what? We can get another one and again our things are going into storage. If we are a few weeks in and this tin can gets a little too tight for our liking everything is waiting for us to start over. Although, I am not too scared because as I write this we’ve owned this Airstream about a month and ½ and we’ve already done about 3 and ½ weeks in this thing, and we are doing fine. No, we won’t be traveling all the time. Just some of the time. At most, maybe 50% on a crazy month. How does this work? Where will we live? It works because my job is remote and Ryan’s job involves a lot of travel within the southern United States making it all relatively easy to get from point A to point B with the Airstream together as a family. When he is not making field visits, he puts on his business casual threads and goes to an office in a high rise in Houston. Pretty standard and not too wild and exciting. Houston, fortunately, has a lot of beautiful RV resorts with great amenities which we will make our home base. These are the questions I’ve been getting a lot of, and the main thing is that at the end of the day we are just looking for more freedom. Like any hard-working family, we started to feel like our commitments were holding us back a little and taking up a lot of time. We don’t want to completely drop off the edge of society we just want a little more of that time back and a little more freedom when it comes to travel. Ryan’s traveled his entire career and now having the flexibility to do it as a family has changed our dynamic for the better. I didn’t want to eliminate our obligations. What I wanted to do is experiment with different choices even if that meant an entirely different living arrangement to make those obligations work for us. So there you have it! The most common questions so far to the revelation that we’ll be moving into our Airstream come June. If you’ve got more, please feel free to leave them in the comments below. I’m more than happy to answer and share this with all of you! I’m not. I’m one of them! 🙂 Ditch the jobs, travel full-time, it sounds like a dream but it’s not a reality for most and I understand how my current circumstances, which represent a tiny sliver of that dream, are not just a product of the hard-work it took to get here but also the luxury that comes with such fortunate circumstances. I am constantly thinking about this from a social and economic standpoint which is why I am so motivated to see how an alternative living situation can fit into a normal life with jobs, kid, whatnot.